After shutting out then-No. 16 Arizona State at Maples Pavilion on Friday night, the Stanford women’s volleyball team heads into perhaps its most difficult road trip of the season on a high note riding a seven-game winning streak. The No. 7 Cardinal (9-2, 2-0 Pac-12) left the Farm yesterday for matches against the No. 16 UCLA Bruins (9-3, 0-2) tonight and to take on the No. 2 USC Trojans (12-1, 2-0) on Friday. Last season, Stanford took both games from the Bruins, winning at Maples in a five-set thriller before beating them to clinch the Pac-12 title in four sets in the Bruins’ first game at the new Pauley Pavilion. The Bruins will be hungry to beat Stanford for the first time on the new court. The Bruins are averaging a .271 hitting percentage, good for sixth in the conference. One of the three players to keep an eye on is junior outside hitter Karsta Lowe, who ranks fifth in the Pac-12 and leads the team in kills with 4.04 per set while hitting .350. Senior middle blocker Mariana Aquino leads the Bruins in blocks with 1.13 per set and is sixth in the conference with a .415 attack percentage. Finally, senior outside hitter Kelly Reeves has been recording 2.78 kills and 2.96 digs per set. However, the team that will give the Card the greatest challenge in winning a repeat conference title (besides No. 1 Washington) is USC. The Trojans dealt Stanford its only Pac-12 loss last season at the Galen Center in a four-set match. However, the Card had already protected its home court and ended up splitting the series with USC. Both teams are not only aiming for the Pac-12 crown but also for the illustrious NCAA title this year. The Trojans’ only loss of this season came from then-No. 9 San Diego at the beginning of September. Stanford’s only two losses were also against ranked opponents—No. 3 Florida and No. 4 Texas. The Trojans are hitting .285 and are second best in the Pac-12 with 1.53 aces per set. Sophomore outside hitter Samantha Bricio averages 3.20 kills per set and is the reason behind USC’s high number of aces, recording .730 per set herself. Senior middle blocker Alexis Olgard has the fourth-highest hitting percentage in the conference at .418 and is ninth in the Pac-12 with 1.16 blocks per set. Senior libero Natalie Hagglund controls the Trojan defense with 4.69 digs per set, good for second in the Pac-12 conference. Stanford has been experiencing leadership and strong contributions from all of its starters across the board. Sophomore setter Madi Bugg has been the facilitator of the offense, allowing all of her teammates to get a piece of the ball. 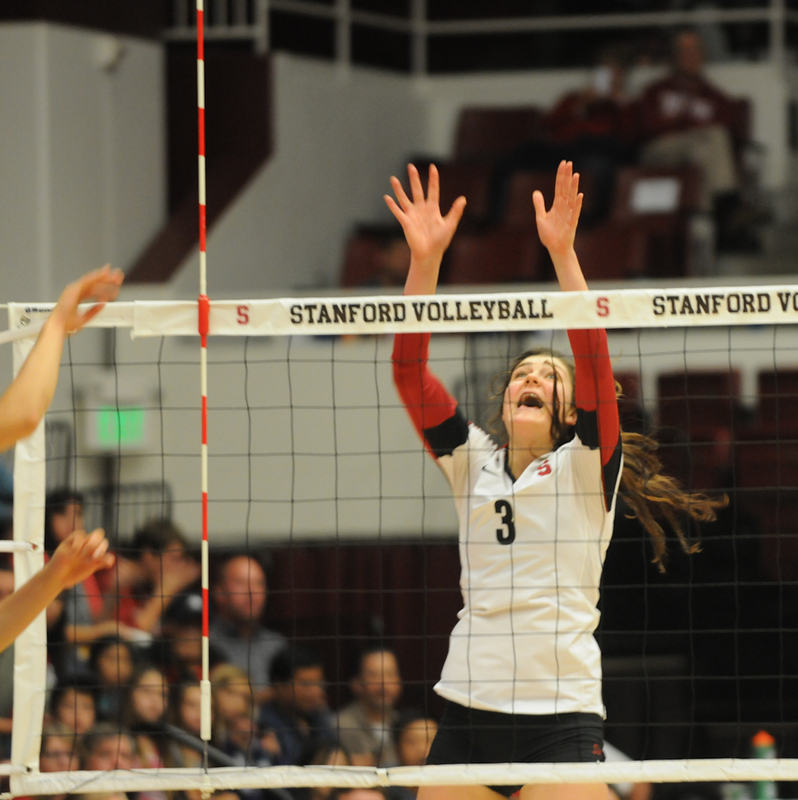 She ranks second in the Pac-12 and 10th in the nation with 11.62 assists per set. Williams leads the team in double-doubles with five, of which three were earned consecutively. She also leads the team in kills per set at 3.11, tied with fellow senior Carly Wopat. Wopat is also a threat at the net in terms of blocking, ranking third in school history with her 1.37 blocks per set average. With great leadership from its seniors and tremendous support from its sophomore class, the Card is expected to compete at the highest level in Los Angeles starting tonight at Pauley Pavilion and continuing Friday night at the Galen Center.